“I would never put a rug in our assortment that I wouldn’t want to sell to my best friend,” Jenon Bailie, our Merchandising Manager, told me, as she sifted through samples of rug patterns, materials and colors; each patterned rug, though different in its graphic story, is sold by Room & Board for the same reason: it’s timeless. “We’re inspired by vintage and classic patterns and patterns from the past, but we play with the scale of the pattern and then put it in a fresh color palette to complement today’s modern lifestyle,” says Jenon. “Patterns beautifully bounce off each other if you add them in subtle and bold ways. 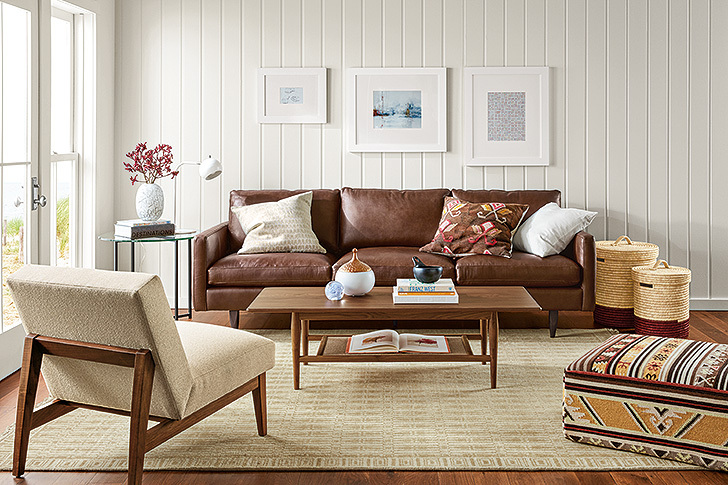 Let a large, graphic rug anchor the room then bridge it together with softer patterns or colors in an accent chair or throw pillows.” Neutral furniture, like the leather Jasper sofa and Edwin chair, make room for bold graphics from the Tulum rug and get help from other fun patterns in the pillows. 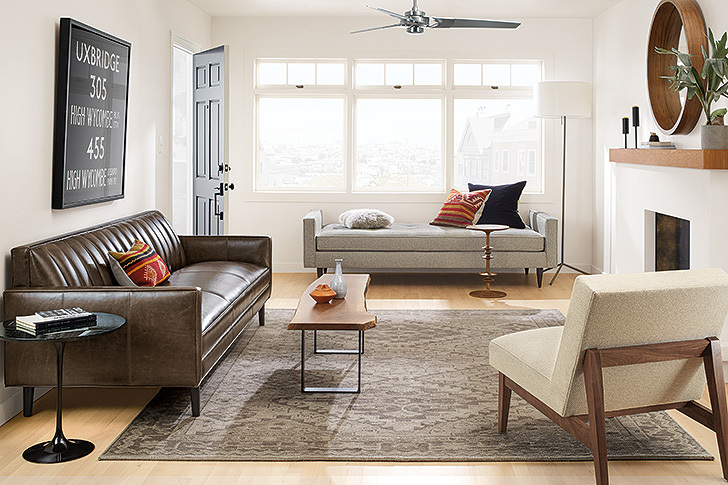 “We’re inspired by colors from earth, not from fashion, so none of our rugs will ever feel out of style. 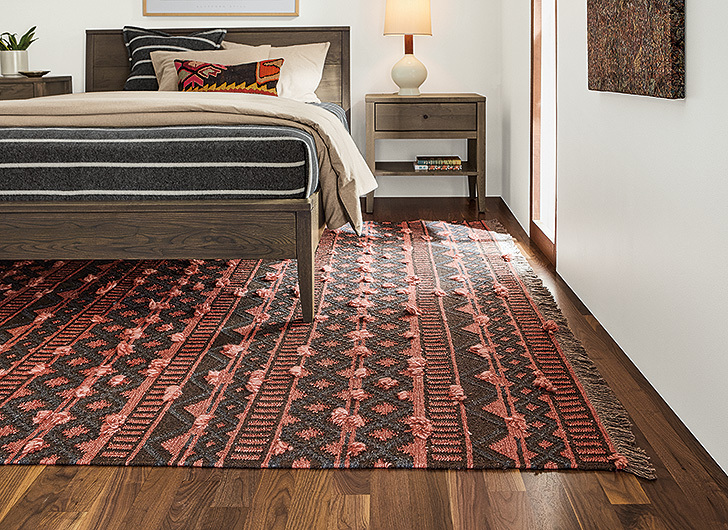 I love the flashes of warm wood hues in our Kayseri rug and desert tones in the Ember rug. You can see hints of Scottish countryside in Heriz.” Also check out how this rug is niiiiiice and big – you’ll love having that soft landing pad for your toes in the morning. “We scale each rug pattern so you get its full essence no matter which size you choose. It makes it so easy to get the size you need without sacrificing style.” The Marquise rug is a great gateway rug for infusing lots of pattern. 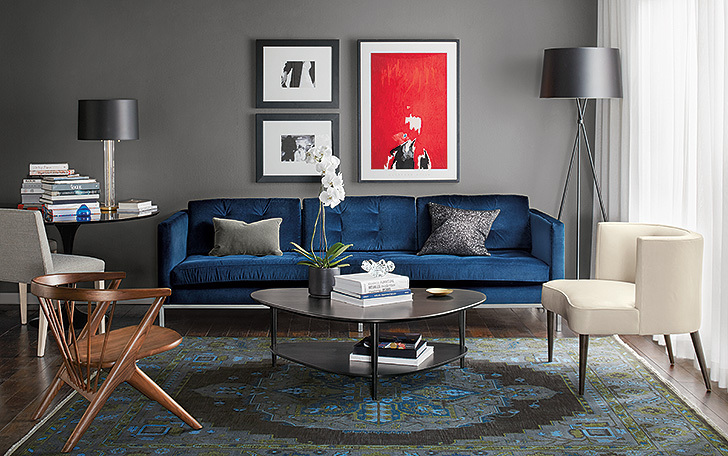 Because of its neutral palette, you still get a statement rug in this room that doesn’t feel overwhelming. Get more help from our expert Design Associates with our free design services for projects large or small. Included pictures are so great, love the color combinations.